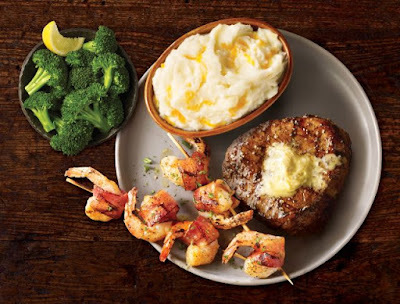 TGI Fridays looks to improve the menu with a number of new dishes that they're highlighting with the "Choose Two Meats Off The Grill" special, which includes two meats and two sides for $14.99. - New Center-Cut Sirloin - A 6-ounce center-cut sirloin seasoned with a hickory-smoked sea salt and topped with parmesan butter. - New Half-Rack of Fridays Big Ribs - A half rack of the chain's recently introduced Big Ribs. - New Dragon-Glazed Salmon - An Atlantic salmon filet brushed with a sweet and spicy Korean barbecue sauce and topped with mango pico de gallo. - New Bacon-Wrapped Grilled Shrimp - Two skewers of three large jumbo shrimp, wrapped in hardwood-smoked bacon and brushed with a parmesan butter sauce. - New Parmesan-Crusted Chicken - Parmesan-Crusted Chicken topped with a white poblano queso and toasted with crispy Parmesan bread crumbs.